I've been having a little fun with my Bernina, and it's about time too! For my 50th birthday the year before last, Colin bought me my new sewing machine, a Bernina Aurora 440! I absolutely love it, but I'm ashamed to have to admit that I've not played with it very much! At the moment I don't have anywhere where I can keep it out permanently, so that whenever I have a few spare moments I can have a play and learn new things. A lot of the time it's just not worth setting it up and pulling out all the other paraphernalia just to have to pack it all up and put away again! 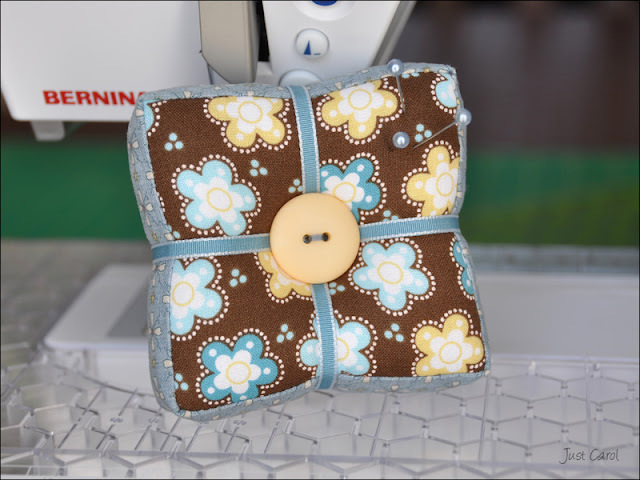 I'm not very experienced with machine sewing, only ever using one for taking up hems, and for finishing the little pillows and drawstring bags/pouches which I have pictures of here on my blog. This is the first time I've followed patterns for sewing with a machine and I'm so happy I didn't have any disasters, because it's now given me the incentive to try some of the patterns I've been collecting. I know they're only a little something, but I'm so pleased with how these two little pincushions have turned out. 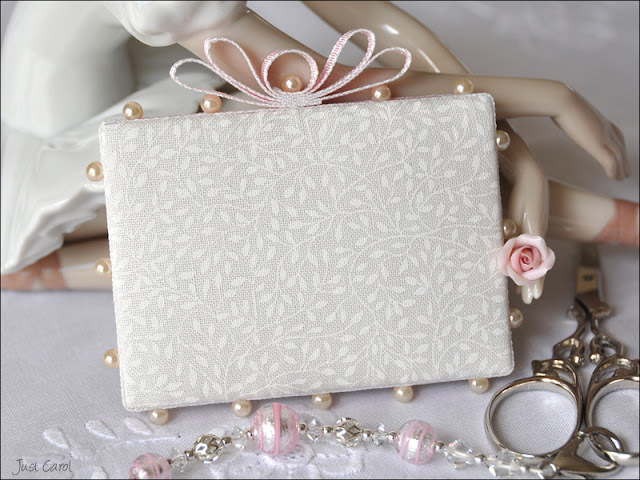 The first is 'Petite Gateau' a pattern by Fig Tree Threads. I used four different prints from At Water's Edge by Blackbird Designs. 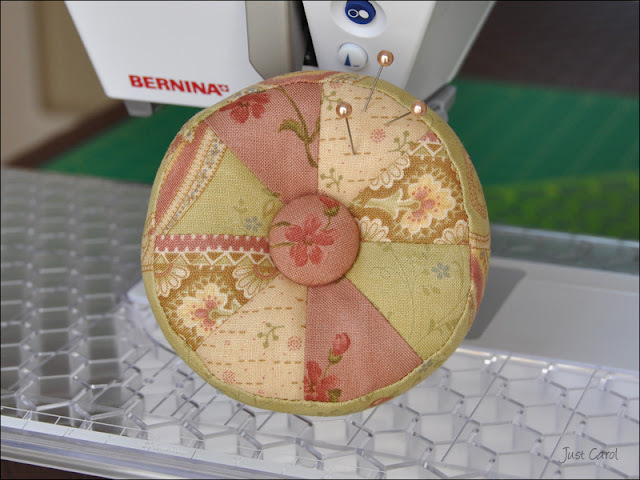 The second is called 'Square Deal Pincushion", a free pattern by Heather Bailey which you can download from her blog here. Bet you didn't expect to see me back again so soon...lol! 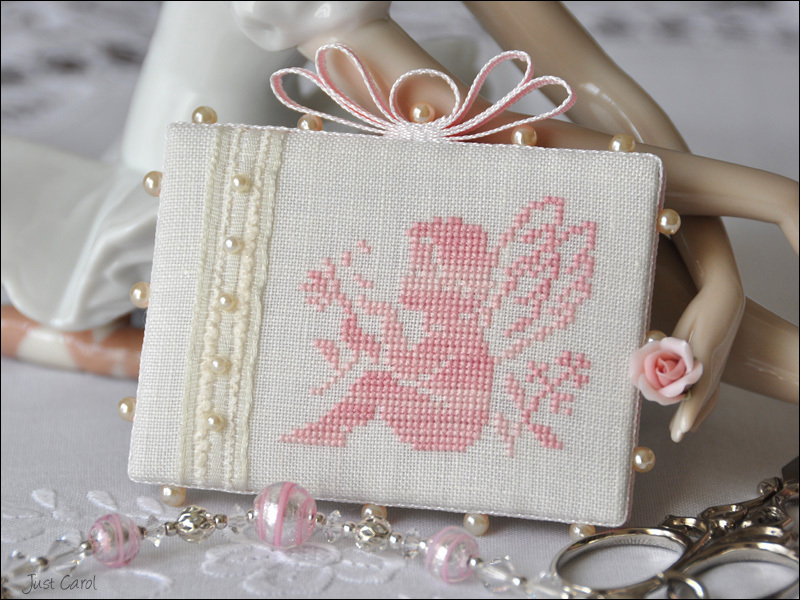 This is a little angel I stitched a couple of years ago for my Mum, and have been wanting to stitch it again for myself. I've used Orchid Belle Soie Silk, 1 over 2 on 48ct cream Gander Linen, so she's turned out a lot smaller this time. I'd thought of a few different ways I would like to finish her, but eventually decided on a quick pinkeep for my pinkeep collection. I attached the pretty ivory ribbon down the side, with tiny pearls that I found while rummaging through my stash! The pink ribbon trim is some gorgeous taffeta ribbon which I've recently started collecting from Stampin' Up. It won't be long now before I have all the colours they do in the ⅛" width. When I last stitched this angel I thought it was a freebie, but I'm not so sure it is now, as I know it can also be found in the book Rouge published by Marabout. If anyone out there has any other information about this little angel I would love to know.